You know how important Omega-3 fatty acid supplementation is for dogs and cats. The anti-inflammatory effects of Omega-3s EPA (eicosapentanoic acid) and DHA (docosahexanoic acid) have been thoroughly researched. Omega-3 supplementation has been abundantly proven to be beneficial for dogs and cats for a wide variety of conditions, including chronic kidney disease(1), arthritis(2), allergies(3), and skin and coat problems(4). The vast majority of plant-based oils are in the form of Omega-6 fatty acids, which are already over-supplied in our pets’ diets. Flaxseeds and a few other seeds and nuts also contain the Omega-3 alpha-linolenic acid (ALA). ALA has beneficial effects of its own, particularly on skin and coat health. However, dogs and cats (and humans) cannot convert more than 1-2% of it into EPA and virtually zero to DHA (the essential fatty acids that are so important to health)(5). Only marine oils contain these particular Omega-3s in a completely bioavailable form. Fish and cod liver oil are the most common and popular sources of EPA and DHA. However, these can be surprisingly problematic. Most salmon oil (and all salmon products from the Atlantic Ocean, Scotland, and Norway) comes primarily from farm-raised salmon. These factory-farmed fish are grown in polluted, overcrowded pens; they are heavily vaccinated(**), and fed antifungals, parasiticides, and antibiotics; and they contain up to 10 times more mercury, dioxins, PCBs, and other toxins than wild fish. Farmed salmon also pose a serious threat to wild species in both Atlantic and Pacific oceans from parasites (6), disease (7), and interbreeding of escaped fish. (8) Additionally, about 1/3 of labeled “Alaska,” “wild,” and “wild-caught” salmon are not necessarily truly wild, but bred and raised in hatcheries; their release into the ocean is threatening both wild salmon, and other fish. (9) If proposed FDA rules take effect, genetically modified salmon products will soon be flooding the stores–and you won’t be able to tell from the label which is which. Cod liver oil is commonly supplemented with Vitamins A and D at levels that could easily become toxic in cats and dogs. Moreover, a loophole in the law allows non-cod species to be labeled as cod. There are also oils made from other fish, such as menhaden (a threatened keystone species, and the source of most unspecified “fish oil”). Sardine, herring, and anchovy oils are, so far, more sustainable and cleaner than most other fish oils. Krill oil is a non-fish alternative Omega-3 product that is gaining in popularity. Krill (tiny shrimp-like crustaceans), are the keystone species and major food source for many marine animals, including fish, whales, seals, squid, and birds. Krill are utilized for oil, as well as being processed into food for farmed fish. The global biomass of krill is enormous, and krill oil promoters claim that it’s impossible to over-harvest it. On a global scale, that may be true; but the problem is that they are being harvested in and around critical feeding grounds of the animals that eat them. This is already causing local areas of depletion, threatening dozens of species of fish, seabirds, and mammals, including whales, which are already at higher risk from melting ice packs and warming sea temperatures. New Zealand greenlip mussels (Perna canaliculus, GLM) are grown under a Sustainable Farming Program that ensures the long term viability of the greenlip mussel industry, with minimum impact on the environment. GLM are bi-valve mollusks known to be a rich source of 33 fatty acids, of which 5 are Omega 3s (including essential Omega 3s EPA, DHA, and alpha linolenic acid). One of GLM’s unique array of Omega 3s is ETA (eicosatetraenoic acid). ETA–which is not found in any other food to any measurable degree–has extremely powerful ant-inflammatory properties. GLM oil has less saturated fat, and more mono- and polyunsaturated fats, than fish oil or cod liver oil. Moxxor produces an ideal greenlip mussel oil: it is organic; sustainably grown; humanely processed; cold-extracted; and certified to be free of mercury and other toxins and pollutants. It also contains cold-pressed, organic white grape seed husk extract and/or kiwifruit seed oil—these potent oils naturally deactivate free radicals, as well as serving as natural preservatives for the GLM oil. In contrast to many marine oil products, Moxxor is cold processed. As a result, it contains a higher level of “polar” fatty acid molecules (which readily form bonds with surrounding tissues) than other oils, making Moxxor more bioavailable. This, as well as the absence of fillers or carrier oils, is what allows a very small GLM oil capsule to contain more antioxidant power as the larger Krill oil capsules and gigantic fish oil capsules. In order to ensure freshness, the mussels grown for Moxxor are processed in a facility built on the shores of the sound where they are grown and harvested. In addition, the other two components of Moxxor, Sauvignon Blanc grape seed husk extract and kiwifruit seed oil provide additional antioxidant power, including all 8 members of the Vitamin E family. These ingredients also safeguard Moxxor’s freshness and stability by scavenging the oxygen free radicals that cause rancidity. Moxxor comes in a very small capsule, making it easy to give even to small pets. 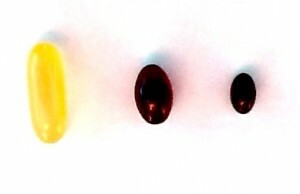 The photo shows the difference between gigantic fish oil capsules (on the left), krill oil capsules (center), and Moxxor (on the right). Moxxor’s mild taste is well accepted, even by cats and fussy dogs. Moxxor is absolutely the best Omega-3 fatty acid supplement for animals as well as people. (1) Bowden RG, Wilson RL, Deike E, et al. Fish oil supplementation lowers C-reactive protein levels independent of triglyceride reduction in patients with end-stage renal disease. Nutri Clin Pract 2009 Aug-Sep;24(4):501-12. (2) Roush JK, Dodd CE, Fritsch DA, et al. Multicenter veterinary practice assessment of the effects ofomega-3 fatty acids on osteoarthritis in dogs. J Am Vet Med Assoc. 2010 Jan 1;236(1):59-66. (3) Abba C, Mussa PP, Vercelli A, Raviri G. Essential fatty acids supplementation in different-stage atopicdogs fed on a controlled diet. J Anim Physiol Anim Nutr (Berl). 2005 Apr-Jun;89(3-6):203-7. (4) Bauer JE. Responses of dogs to dietary omega-3 fatty acids. J Am Vet Med Assoc. 2007 Dec 1;231(11):1657-1661. (5) Dunbar BL, Bigley KE, Bauer JE. Early and sustained enrichment of serum n-3 long chain polyunsaturated fatty acids in dogs fed a flaxseed supplemented diet. Lipids. 2010 Jan;45(1):1-10. (6) Stokstad E. Parasites from fish farms driving wild fish to extinction. Science. 2007 Dec 14;318(5857):1711. (7) Krkošek, M., M.A. Lewis, A. Morton, L.N. Frazer, J.P. Volpe. 2006. Epizootics of wild fish induced by farm fish. Proc Nat Acad Sci. 103:15506-15510. (8) Roberge C, Normandeau E, Einum S, et al. Genetic consequences of interbreeding between farmed and wild Atlantic salmon: insights from the transcriptome. Mol Ecol. 2008 Jan;17(1):314-24. Moxxor is suitable for both, you just decide whether you want to start with 30 or 60 capsules.